The seeds of Abrus precatorius contain the highly toxic plant protein abrin. There is no antidote for abrin poisoning. Management, largely supportive, may consist of administering intravenous fluids, anti-emetics, and activated charcoal depending on the time of exposure. We report the presentation of a single case of unintentional abrin poisoning confirmed by the quantitation of l-abrine biomarker. A previously healthy 22-month-old, 11.5-kg female presented to the hospital after ingesting approximately 20 rosary peas (A. precatorius) sold as a “peace bracelet”. Her primary manifestations were episodes of forceful emesis that included food particles progressing to clear gastric fluid. The patient was tachycardic (HR = 134 bpm) but had brisk capillary refill and normal blood pressure (96/60 mmHg). Laboratory testing revealed elevated blood urea nitrogen (16 mg/dL) and serum creatinine (0.4 mg/dL). In the emergency department, the patient was resuscitated with 40 mL/kg normal saline via peripheral IV and received ondansetron (0.15 mg/kg IV) to control retching. The patient was discharged well 24 h after the ingestion. 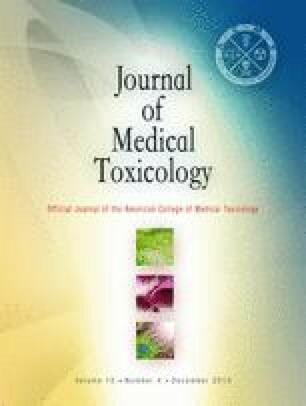 This is the first case of human abrin toxin poisoning confirmed by the quantitation of l-abrine as a biomarker. Quantifying the levels of abrin toxin in the body after exposure can help clinicians make informed decisions when managing patients with symptomatic exposures to seeds of A. precatorius. We would like to thank Mr. Stephen Stanfill for technical editing of this manuscript. The findings and conclusions in this report are those of the author(s) and do not necessarily represent the views of the Centers for Disease Control and Prevention/the Agency for Toxic Substances and Disease Registry.